One of the great things about working at Aconex is that no two teams work in an identical way. Each team has it's own methods and techniques that it has developed. We try to share good practices across the teams in various forums and channels, but that just keeps teams looking for their own new innovations to keep themselves distinct. Let me share an example. 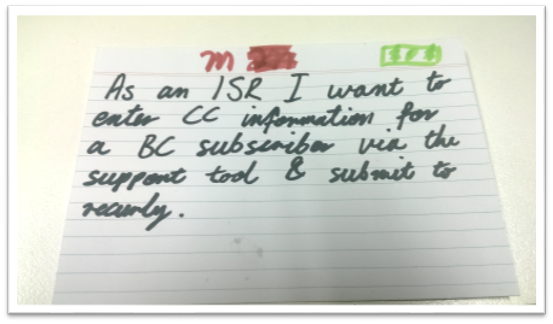 Below is a User Story card, a pretty straightforward artifact. The front has the common "As a, I want" form, which is a default pattern across the industry. This team use it regularly (but not dogmatically.) You'll see common signals that this is a team that interacts with the card - the size estimate has been adjusted from perhaps small to medium (M!). There is an icon that says this card is about revenue on the top right. What do you see? Four, possibly five sets of handwriting. "So what?" you ask. It may seem small, but it's a thing that we see all too rarely out in the wild. When you put things in your own words you are internalising and then externalising the idea which does a better job of validating your understanding. So what are the implication of this innovation? Why don't we see more whole team authorship of User Story cards? 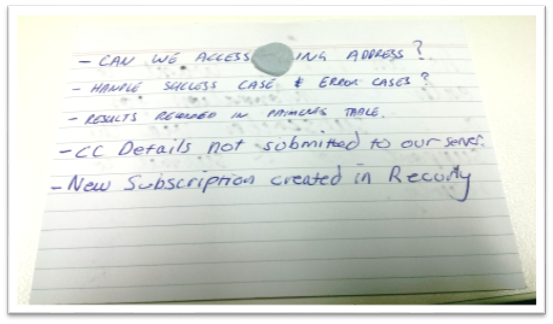 Is it an anti-pattern that product owners and business owners are delegated the task of card writing? Does the usual pattern of the BA/PO writing cards actively impede communication of ideas to developers who are going to execute the work? It's worth mulling over isn't it?